Google has admitted that it was not rigorous enough in its testing of the new Google Buzz service, and issued an apology for the problems and privacy issues users are experiencing. Buzz's early impact has been hit hard by the problems with the service – with things like the integration of third-party sites like Twitter not working as they were expected to at this point. But it was the privacy issues – like the lists automatically created of the people you were following or being followed by – and the decision to make the lists public by default that attracted the most vitriol. Talking to the BBC, Product Manager Todd Jackson said: "We're very early in this space. This was one of our first big attempts. "We've been testing Buzz internally at Google for a while. 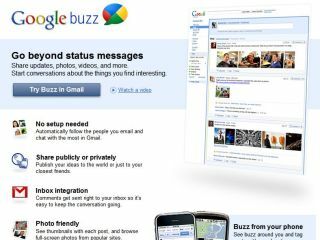 Of course, getting feedback from 20,000 Googlers isn't quite the same as letting Gmail users play with Buzz in the wild." "If it becomes clear that people don't think we've done enough, we'll make more changes," added Jackson. Jackson also told the BBC that "tens of millions" of users were "rightfully upset" and that the firm was "very, very sorry". "We know we need to improve things," he said. It's an eye-opening admission from Google as they try to compete with the likes of Facebook and Twitter – with Buzz given a major launch and clearly seen as a key product for the company. "We worked around the clock to make the code changes for these improvements; now we're putting them through a full testing process to identify any bugs and translating them into 53 languages so they reach all Gmail users," concluded Jackson.